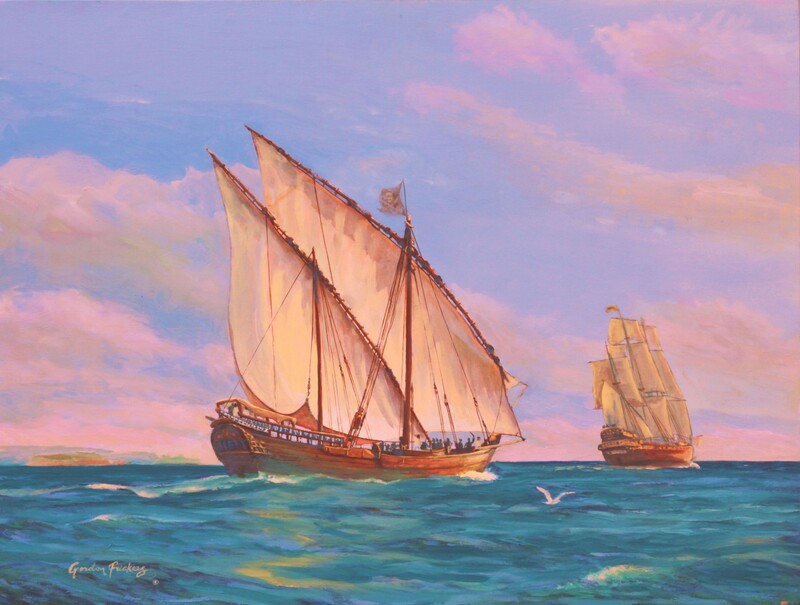 Dhow in pursuit of a Portuguese galleon, 63 x 53 cm (25″ x 21″), oils, available, £1,500. ex studio, ex frame. This beautiful lively marine painting, ‘Pirates !’ shows men and dhow engaged in an ancient trade. When the early Portuguese explorers, traders, men like the famous Vasco de Gama, driven by the king, “Henry the Navigator”, and wishing to spread Christianity, courageously pioneered the route round the Cape of Good Hope, they were the first Europeans to enter the Indian Ocean. 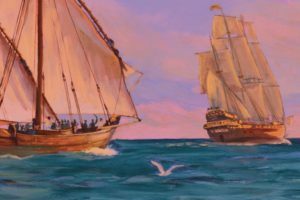 They received a mixed reception on the East African coast and at sea often found themselves under attack by Arab pirates using dhows. The more strongly built more modern Portuguese Carracks and Caravels simply shot the relatively fragile dhows to pieces. The ‘upshot’ of that was dhows began to be improved. Many dhow builders copied and adapted what their crews and builders thought they saw in the superior Portuguese ships. Today you can still see dhows built and echoing their Portuguese influence, most notably in the Bagalah variations. Dhows, vessels built by a methods of very ancient origin. Some types with planks sewn together, a method we know from tombs, was used by ancient Egyptians, for example the Sanbec types, built by the same methods used with ships found in tombs of Pharaohs’. Although leaky, the technique produces a flexible hull well suited for sheltered waters and taking the ground when handling cargos. Other types, relatively more sturdily built were ocean going, voyaging extensively in on the Indian Ocean, Persian Gulf, Red Sea and we think at times, as far as China. Dhows with their very long ancestry, have seen more adventures than there are in Arabian Nights; and are still used by Somali Pirates!